I have a new scar (I like scars). It was twice-made three weeks ago today. First, by a thyroidectomy and second, hours later, in an emergency procedure to address an arterial bleed, also known as “that time you were partially decapitated” by my dear (most inadequate adjective) Susan, who was there and who, by being there, may well have saved my life. Doctors had to reopen my neck at the bedside with me still awake, and it was one of the scarier medical moments of my life (a life that’s been riddled with experiencing and witnessing a lot of scary medical moments). Susan and I may have only just, respectively, stopped shaking from the surreal adventure. I’m okay. I’ve been incredibly supported by friends through this experience and that support has been a well of feeling love and home. I can’t yet lift my head too high — so if we hug that’s why I’m resting my cheek on your chest (so cozy!) — and I’m navigating fluctuating calcium levels and new hormones. Also, my voice. Truth is, I postponed this surgery until after my CD release tour in case it changed my voice. At inspection, my vocal cords are not permanently damaged. They are, temporarily I’m told, by use, changed. My voice is weakened, breathy, and pitchy (pitchy!!). Notes are airy and truncated. Some are out of reach. My voice is slightly unfamiliar and a little wild. I’m getting to know her and she holds surprises. She sounds like me. But different. It’s only been three weeks. In the moments that the doctors and nurses were addressing the haematoma, I was staring up at the ceiling thinking “I probably won’t die because there are all these people here to fix this, but I do need space for the pain.” Thank you mindfulness training for planting that thought. I was having difficulty breathing, and blood was pouring down my chest as the surgeon’s fingers pulled open skin, muscle, and pulled clots out of the cavity of my neck. I looked at Susan and saw her fear; I felt fear. I looked at the surgeon and saw his steadiness. I thought about not fighting the pain. In a week, I’ll be playing a grand piano in Koerner Hall in Toronto as part of my presentation at this year’s ideacity. It’s a remarkable opportunity. And I’ll be showing up with the new voice. All I can do is invite that voice in, and invite others to receive it as I do in every performance. I can’t wish this voice were something it’s not. I can’t fight with it. Easier said that done, but hey, what’s a practice of trying to be present without reminders of why? Because things can change in an instant. 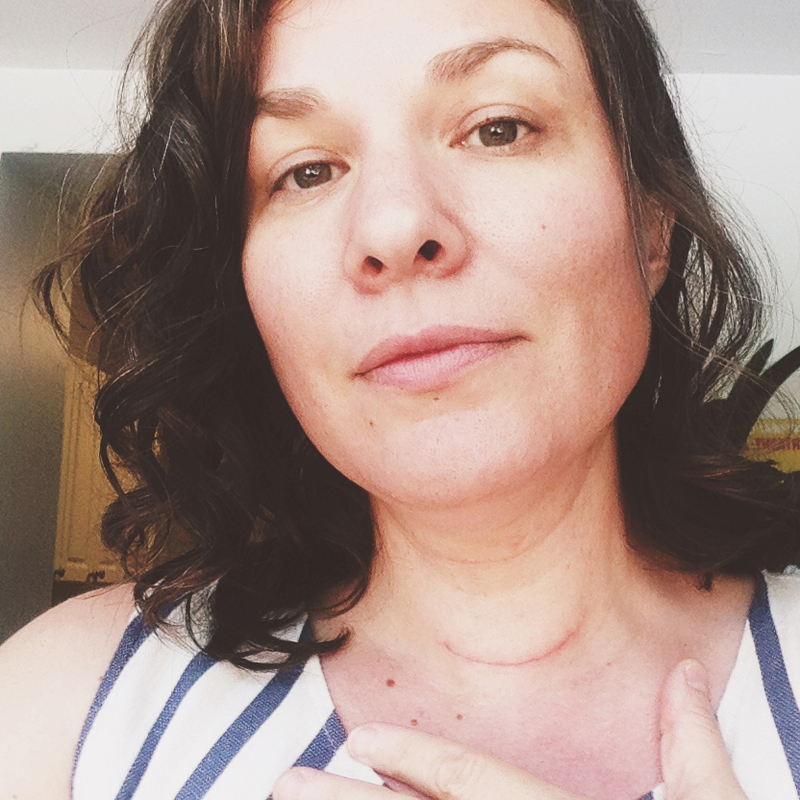 After ideacity, I’ll be resting this voice and giving it time to return to/find new strength, singing softly to my garden and the trees that frame it, singing to you from here, maybe coming up with new stories of How I Got This Scar (knife fight? Bear attack? Sloppy vampire? ), and plotting my next bold move. Bless you Christa, and your doctor and your dearest of friends, Susan. Wow! Glad it was fixed and Susan was there with you. Sending you lots of love. You Christa, are an awesome, gifted writer…. and what a treat THAT Is. As for your singing…. a glorious part of the gift. Thank you for all you give to the world ~ and pleased to hear that you are under repair.